Definition at line 72 of file TypeBasedAliasAnalysis.h. Definition at line 724 of file TypeBasedAliasAnalysis.cpp. Definition at line 733 of file TypeBasedAliasAnalysis.cpp. Definition at line 728 of file TypeBasedAliasAnalysis.cpp. 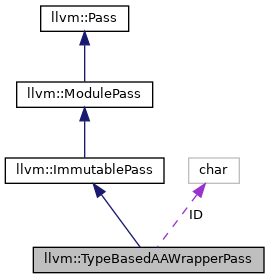 Definition at line 738 of file TypeBasedAliasAnalysis.cpp. Definition at line 80 of file TypeBasedAliasAnalysis.h. Definition at line 81 of file TypeBasedAliasAnalysis.h. Definition at line 76 of file TypeBasedAliasAnalysis.h.